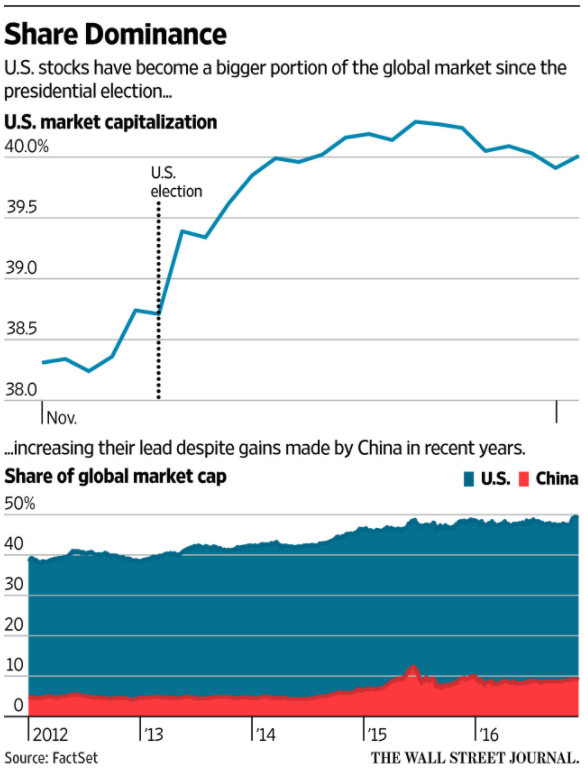 Since 2012 alone, the U.S. share of global stock market capitalization has risen from roughly 35% to just over 40% of the total. U.S. stocks have slaughtered international markets throughout this cycle. I’ve had plenty of questions from investors asking me why they should ever own foreign stocks when they see these types of returns. It’s a legitimate concern. We humans are an impatient group so it can be difficult to see valid reasons for diversification when presented with performance numbers like this. The performance spreads in December of 2001 were fairly similar to the ones we see today. Those numbers had completely reversed by 2006 and stayed that way through 2010 until coming full circle today. It’s easy to say that you’ll be happy only investing in U.S. stocks today because it feels much better when you’re invested in the best performer as opposed to the worst performer. It may not be all that easy when the cycle inevitably turns. And it will turn at some point. The U.S. doesn’t have a monopoly on stock market returns, profit growth, dividend payments, innovation or good ideas. The problem for many investors is that they only want to be invested in the best performer so they end up chasing what’s worked well lately. Seeing these kinds of relative performance spreads invites the hindsight bias to allow us to assume we knew exactly what was going to happen. The hardest part about cycles is that there’s no rhyme or reason to their length or magnitude. It’s certainly possible that U.S. stocks could continue their strong relative performance for a number of years. Or it could end tomorrow. No one really knows. Investors are a fickle bunch. There are all sorts of intelligent-sounding reasons to avoid foreign stocks at the moment — stagnant economic growth, poor demographics, the European Union seems like a mess, political instability, etc. The thing to remember here is that the stock market has obviously already picked up on these things; that’s why market performance has been so poor. Things could definitely get worse, but it doesn’t have to get better for markets to recover; things just have to get less worse. 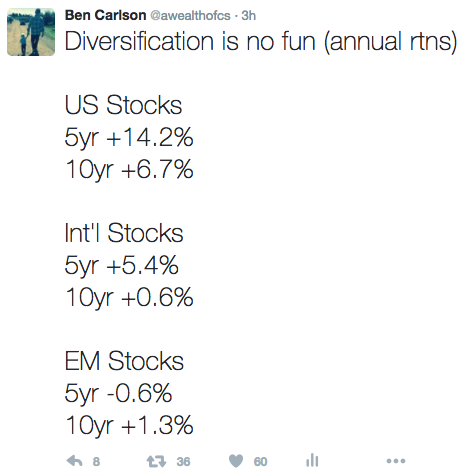 Diversification is not fun, but intelligent investing shouldn’t be about having fun.